Some unusual things happened in Portland, Oregon on March 28. It snowed. Then the sun came out. Then it snowed again. And Bruce Springsteen and the E Street Band played the Rose Garden. It was a Friday to remember. Playing to a slightly less than capacity crown, and on the road in support of his rocking, serious-minded new album "Magic," Bruce and his band of brothers breathed fist-pumping energy into an incomparably great repertoire and blew away any apathetic shadow that might have loomed over the hearts of all assembled. Springsteen was in the house, and Portland was on its feet. Though the well-paced, career-spanning setlist for the Rose Garden show followed roughly the same pattern as most shows of this second leg of the "Magic" trek (Born to Run's saxophone-heavy call to action "Night" as the opener, into "Radio Nowhere," etc. ), it was clear that the framework Springsteen wanted consisted of the "Magic" material. Indeed, the new songs came off more powerfully than the obligatory favorites ("Born to Run," "Dancing in the Dark") and Bruce geek-appeasing deep cuts (a slightly tentative version of "For You"). Standing out among the recent material was the driving "Last to Die," both a no-nonsense elegy to the soldiers and foreign civilians dying daily overseas and an indictment of the leaders and politics whose mistakes have cost those lives. Several songs earlier, the haunting title cut of the new album found Bruce in stripped-down mode, with only fiddle player Soozie Tyrell accompanying him. With its sleight-of-hand message and words of resignation, "This is what will be," it proved one of the most telling and resonant moments of the 2 hour, 20-minute show. Despite his seriousness and sense of artistic responsibility, the stage has never been a bully pulpit for Bruce; if anything, it's the ground floor for rock n' roll revival, and reverend Springsteen preached from the good songbook. The defiant "Prove It All Night" was a triumph, as were the joyous "She's the One" and the harmonica-seared, stomping-blues take on "Reason to Believe." 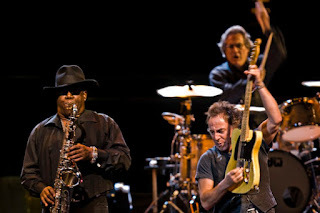 The entire performance was spectacular, with Bruce, Steven Van Zandt, Nils Lofgren, Gary Tallent, Clarence Clemons, Max Weinberg, Tyrell and Charlie Giordano (subbing for the cancer-stricken E-Streeter Danny Federici) anticipating each other's moves perfectly and giving their all to every number. While the show's cruising altitude was high throughout, two songs that were requested by audience signs jetted even higher into the stratosphere: the devastating slow-burner "Lost in the Flood" (in place of "The River" on the setlist) and the gorgeous, climactic "Jungleland," where Clemons' soaring and heart-rending sax solo alone was a testament to the incredible power of rock n' roll. By the time Bruce and the E Streeters closed with the uplifting Pete Seeger rave-up "American Land," the Rose Garden was pleasantly exhausted. Bruce? He was just getting started, it seemed. Great review! It was a really special concert, and definitely one of the best ones I've ever seen. I have been listening to Bruce non-stop since the concert, especially "Livin' In the Future" and "American Land". Glad I was there to share it all with you! Love your blog. Big fan of Bruce. Thanks for the review. Excellent!Still have "Reason to Believe" and "She's the One" rolling around in my head. Long Live Bruce and E Street! Why aren't you writing for Rolling Stone guy?